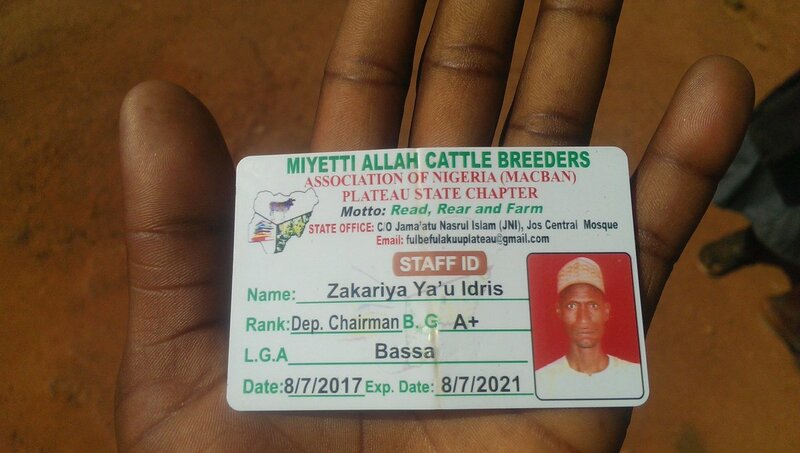 An identity card belonging to Zakariya Ya’u Idris, the deputy chairman of the Bassa Local Government Area of Plateau State faction of Miyetti Allah Cattle Breeders Association of Nigeria, was found at the scene of a bloody attack, Punch reports. Suspected Fulani Herdsmen had staged an attack in Irigwe of the state, taking several lives. The identity card was seen at the scene of an attack where people were killed. The issue of identity cards is a small matter. We also recovered telephone handsets. We have reported the matter to the Police and the items have been taken for investigation. The owner of the ID card is the deputy chairman of MACBAN in Bassa LGA. He was chased out of his own house. He left this document inside his own house, and they entered and picked it and then went away with it. The man was running for his life. The incident happened on Wednesday morning. You know, they were attacked very early in the morning before 6:00am. He was in the mosque when they were attacked and he was unable to return to his house. That was how they picked the documents, including the certificates of his children, indigene’s certificates of his wife and children, his identity card, vehicle documents and other personal items. He has reported to the Police and the report has been documented.